Replaces Higher Nature High Strength Collagen! 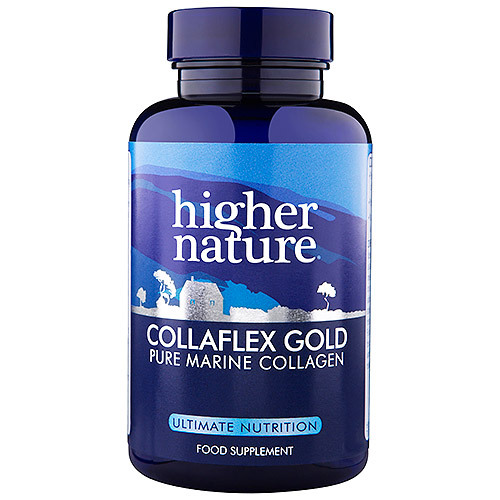 Higher Nature Collaflex Gold contains pure marine collagen. Amongst other things, collagen is a key in the support and maintenance of healthy, supple and flexible joints and the maintenance of healthy young looking skin. Collagen helps form the shiny `cushions` at the joint-ends, needed for comfortable movement. High Strength Collagen provides a good source of marine collagen, hydrolysed for easy absorption. Collagen is the main protein of connective tissue in animals and the most abundant protein in mammals, making up about 25% of the total. It is tough and inextensible, with great tensile strength; it is the main component of cartilage, ligaments and tendons and the main protein component of bone and teeth. Collagen is responsible for skin strength and elasticity, and its degradation leads to wrinkles that accompany aging. Life is a string of complex molecules: polymers. Nature`s most abundant protein polymer is collagen. More than a third of the body`s protein is collagen and it can account for an even higher percentage in particular parts of the body. Collagen makes up 75% of our skin. Collagen acts as a scaffolding for our bodies, it controls cell shape and differentiation and helps broken bones regenerate and wounds heal. The body uses collagen when blood vessels grow to feed healing areas. Collagen is the fibrous protein constituent of skin, cartilage, bone, and other connective tissue. * providing hydroxyproline and hydroxylysine in combination with other amino acids to a 93% minimum protein content. Hydrolysed collagen (from fish [tilapia, catfish and pangasius catfish]), natural lithothamnion calcarea, bulking agent: microcrystalline cellulose; anti-caking agent: magnesium stearate*; zein protein coating. (*vegetarian source). Ideally take 2 tablets a day, 30 minutes before meals or 2 hours after meals, or as your health professional advises, to a maximum of 10 tablets a day. A daily multivitamin/mineral and vitamin C are also recommended. Store in a cool, dry, steam-free environment. Below are reviews of Collaflex Gold - Pure Marine Collagen - 90 Tablets by bodykind customers. If you have tried this product we'd love to hear what you think so please leave a review. 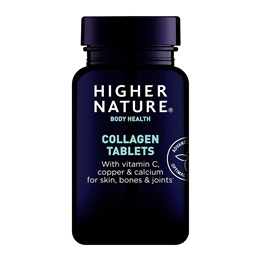 Higher Nature Collaflex Gold is a pure, non shark marine source collagen key in the support and maintenance of healthy, supple and flexible joints and the maintenance of healthy young looking skin.